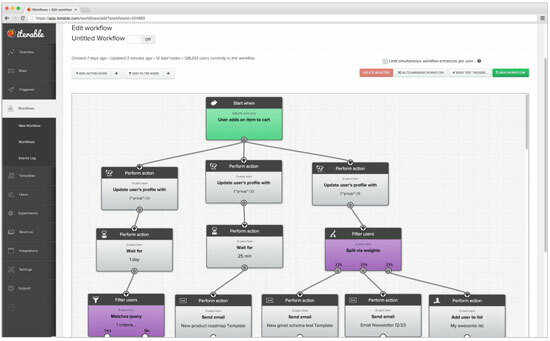 Enterprise-level marketing automation platform Iterable has launched a new feature, dubbed Workflows, that enables users to create and A/B test "multi-pronged" email campaigns to see which message series works best for generating and maximizing conversions (and revenue). “Iterable already has a built-in tool for A/B testing any part of an email. Naturally, the next step was to create the ability to A/B test different series of emails. Traditional drip campaign builders can only create linear workflows with no ability to skip certain steps or to test different flows to see which is the most effective. We decided to fill that gap to help make email simpler and more effective for marketers,” says Justin Zhu, CEO of Iterable. Workflows includes a drag-and-drop editor for designing drip campaigns (which are initiated by a trigger such as a newsletter signup, shopping cart update, purchase or other custom event). Users can also now add in time delays and filters, ensuring that only those subscribers who fulfill certain criteria will move on to the next step. In addition, Workflows even includes a few built-in safeguards such as automatically preventing subscribers from entering a drip campaign more than once or being sent too many emails within a two hour period.